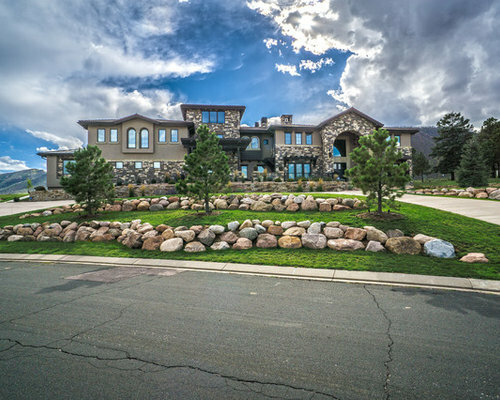 This Mountain Shadows landscape was built after the Waldo Canyon Fire. 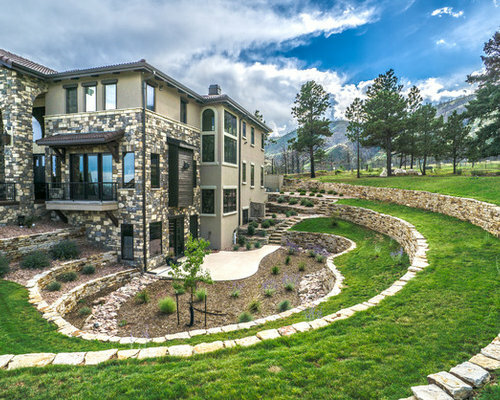 It utilizes Siloam stone retaining walls to created more space for enjoyment and a dramatic effect. 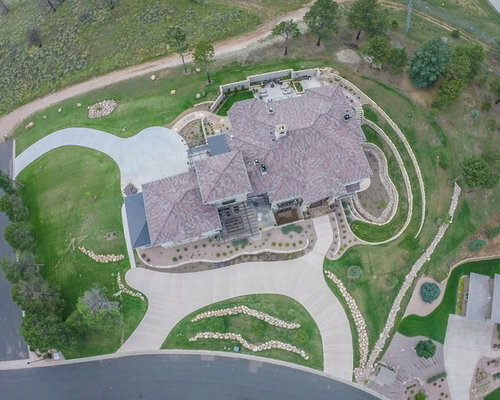 The aerial view gives a nice view of the scope of this landscape. 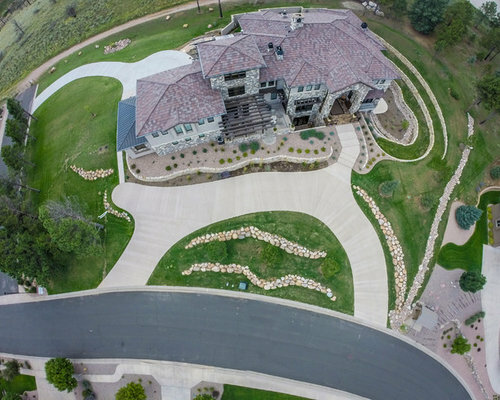 The extensive use of native grass throughout the landscape ensures that this project matches it surroundings, and has the added benefits of being low maintenance and water friendly. 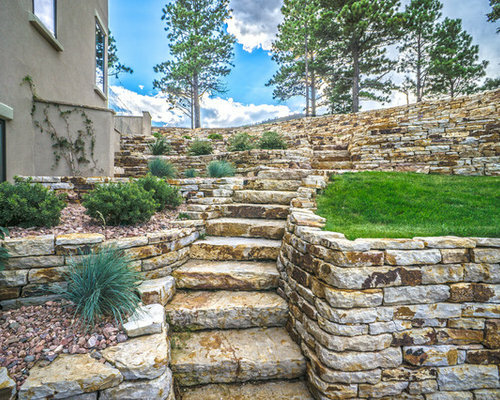 Siloam stone stairs meld seamlessly with the surrounding Siloam stone walls. 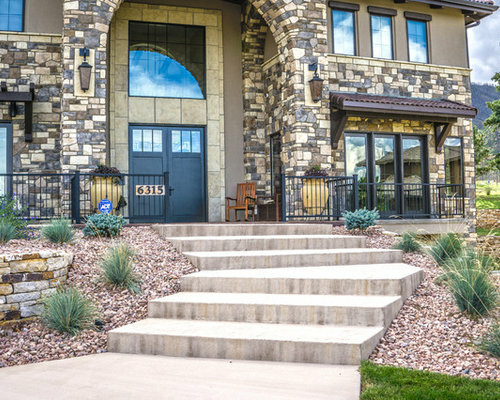 Natural stone slabs create stairways as beautiful as they are practical. Retaining can be used to accommodate many site issues. 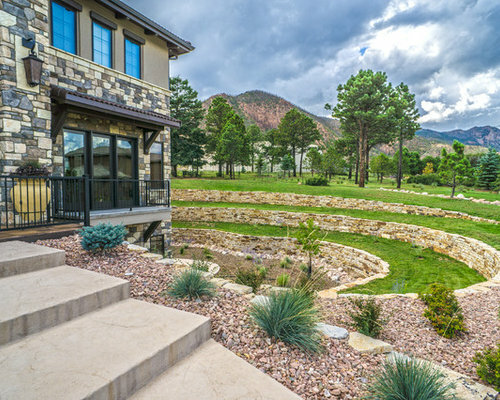 It also creates attractive terraces that open up many landscaping possibilities. 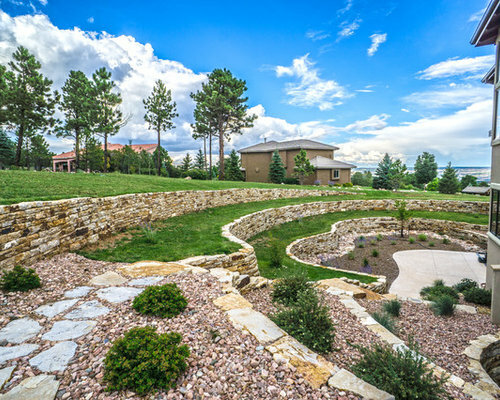 Utilizing native grass and native plants ensure that a landscape thrives and is water friendly. By retaining with multiple tiers, we were able to accommodate a walk out basement. 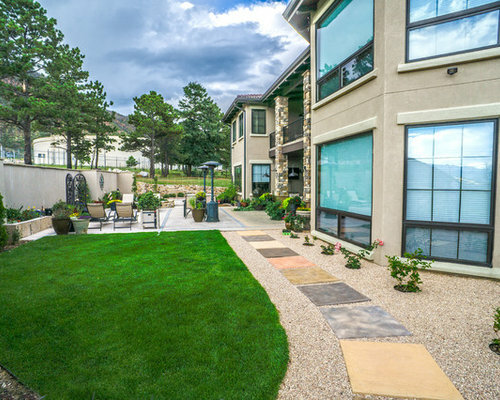 This allows for a spacious and private patio area surrounded by colorful plantings. 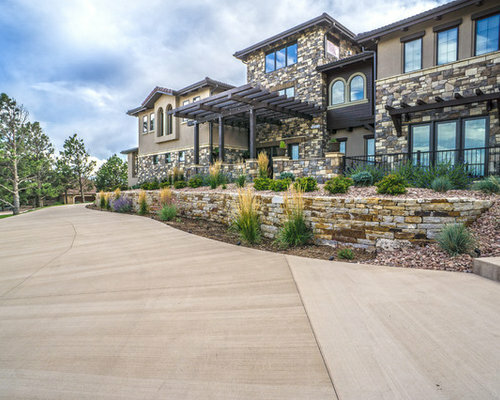 This colored concrete patio compliments its surroundings nicely. Colorful plantings can help bring any space to life. Stucco walls create a private courtyard with lots of opportunities for the avid gardener with raised beds and ample space for a container garden. 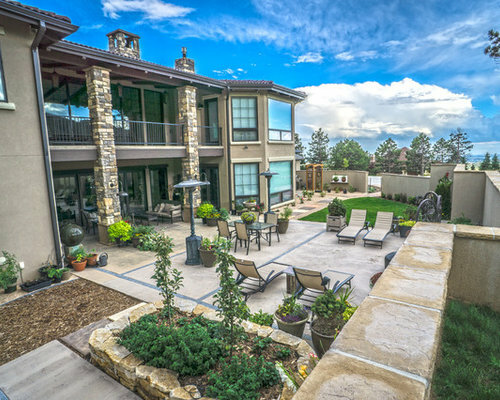 Incorporating outdoor heating creates the possibility of year round enjoyment. 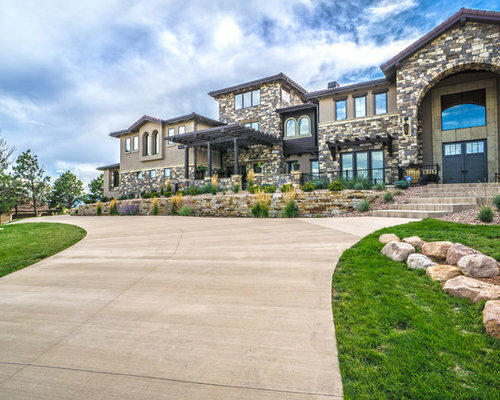 Colored concrete drive and steps, natural stone retaining,and a mixture of colorful plantings and ornamental grasses create an impressive entry to the home. 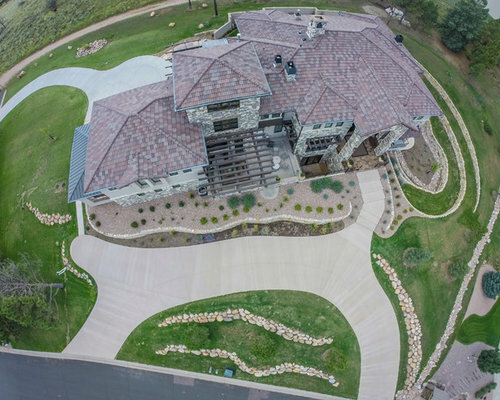 Working with natural and local materials ensures this landscape blends with its native surroundings. Using plantings to frame an entry creates a warm and welcoming entryway. This landscape is a great fit for Mountain Shadows. 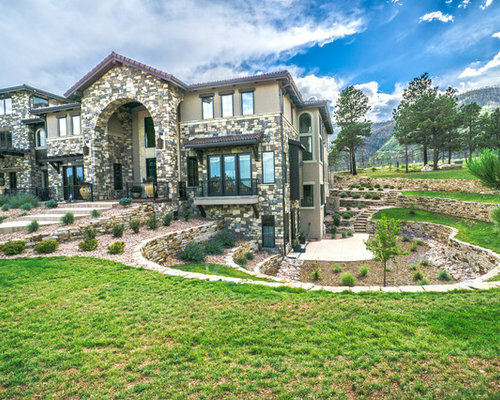 With its lush, green native turf, numerous evergreens, and stunning use of boulder and Siloam stone retaining walls, it provides great curb appeal. 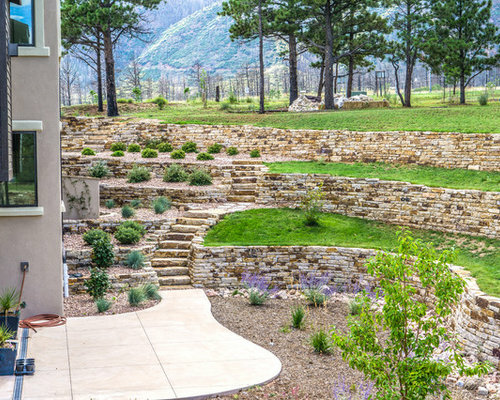 Siloam stone was used to create these beautiful walls. Its color range and uniformity stand out. 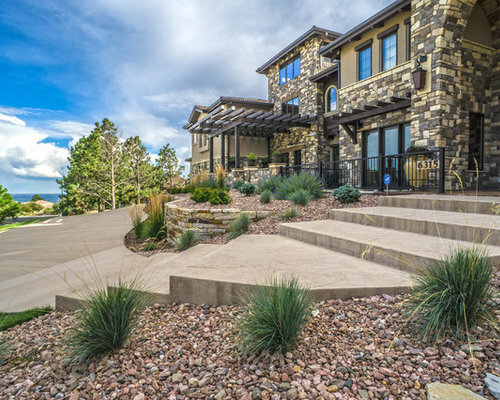 Colored concrete drive and steps, natural stone retaining,and a mixture of colorful plantings and ornamental grasses all blend together nicely. 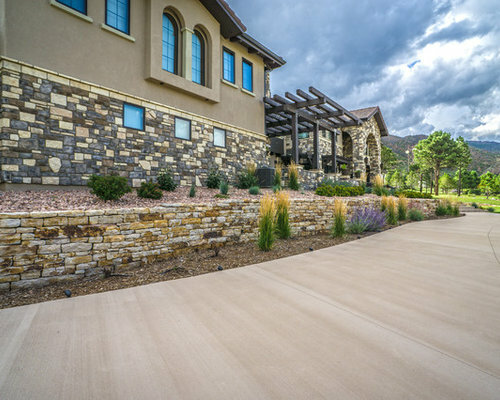 This colored concrete drive complements the rest of the landscape, and provides ample parking for guests.